I've recently had a spot of trouble with epoxy coating due to Amine Blush which is produced by almost all epoxy resins. At least I expect that's the cause, either that or a contaminated cleaning cloth that spread it about rather than washing the surface thoroughly. The problem was that I had applied a rather heavy fill coat which made the problem worse, although it looked great when tipped. Also there was a temperature change from one end of the boat to the other which may have contributed. The problem was worse at the cool end. However, now for the hard earned tip. Sanding down epoxy is an unpleasant task, as we all know. Usually recommended is a random orbital sander which produces harmful dust, and as I don't have a powerful extraction system I generally use wet or dry paper on a block. Fortunately I recently located some paper manufactured in Switzerland which is the best I've ever used, and the backing remains firm even when left in a bucket for a few days. I use a palm sander for preference in my shop and decided to try the wet or dry on it. The problem was attachment, as wet or dry is not hook and loop. I cut out pads from the sheets (80grit) and spray glued them to worn ordinary pads. "BINGO" It works a treat. 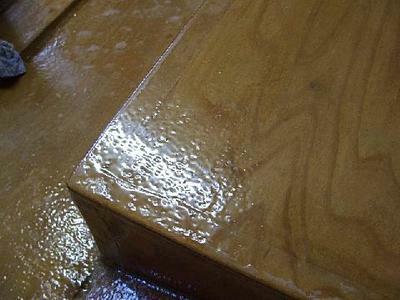 The secret is to drip water in front of the sander from a sponge, just enough to keep lubrication. Grit grade can off course be changed to suit the job in hand. Don't over water, and soak up the white "mud" that is formed before it dries. If you cut the wet or dry paper over-size to the base pad on the sander, say about 1/2 inch, you can work on fillets as the edge curls up. This works particularly well with a triangular palm sander and corners can be attended to with the point. Good for three way corners. One should of course always be certain there is an RCCB in place when using electrics near water, but there is a minimum amount used here. My solution to shop dust. When sanding wood, I use a shop brush to unclog my sandpaper. While brushing, I have the shop vac nozzle placed in a manner that collects the dust cloud. This works well enough that I no longer worry about needing anything specialized. I intend to do something similar when using an orbital sander in building a stitch-n-glue kayak.